As avid followers of New Horizons know, our spacecraft has been mostly hibernating since February, and will continue to so do until Sept. 2, when we will wake it to begin its second annual checkout. Many of you will also recall that New Horizons passed the orbit of Saturn in early June. New Horizons is the first spacecraft to venture this far (a billion kilometers from the Sun!) since the last of the Voyagers accomplished the same milestone in the summer of 1981. 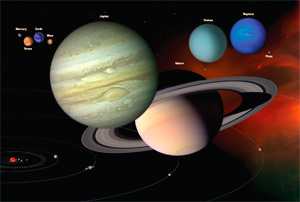 We are now nearly 96 million kilometers (60 million miles) beyond Saturn, and will cross the orbit of Uranus – about 2 billion kilometers from the Sun as Saturn – in March 2011. My last PI Perspective detailed our plans to wake New Horizons up in late May for two weeks of onboard engineering activities. That brief wake-up went well; we re-pointed the antenna and loaded SWAP instrument software, among other accomplishments. We then put our spacecraft back into hibernation on June 3, right on schedule. After that, we resumed our weekly Monday check-ins with the spacecraft to verify its health. In June, what had been our weekly Thursday telemetry (“TLM” on the mission calendar) contacts to monitor engineering during hibernation became every-other-Thursday events. As we gain experience in hibernation, our goal is to check this telemetry just once a month beginning in 2009 (though weekly beacon health-status checks will continue whenever we are in hibernation, right through 2015). Of course, spaceflight isn’t as routine as other forms of flight, and that was re-emphasized to us on Monday, July 7, when our weekly beacon check-in revealed that New Horizons was transmitting a “red” (emergency) beacon instead of its familiar “green” (nominal flight) beacon. This told us that the spacecraft had experienced a significant anomaly in the past week. With the help of NASA’s Deep Space Network of tracking stations, our mission operations team immediately swung into action, contacting the spacecraft that evening and downloading telemetry diagnostics the next day. By mid-week our operations team had diagnosed the problem and had devised a recovery strategy. Our main flight computer had unexpectedly reset itself after becoming hung up in a software loop. By Friday, July 11, our operations and engineering teams had assessed this anomaly, determined that it was safe for the spacecraft to re-enter hibernation, and commanded New Horizons to do so. In the three weeks since, New Horizons has hibernated uneventfully, sending green beacons every Monday while our spacecraft computer engineering team, led by Steve Williams of the Johns Hopkins University Applied Physics Laboratory, worked to diagnose why our main computer (called “C&DH-1”) had gotten itself hung up. Although this investigation is ongoing, we have held a review board and we are using test versions of the C & DH (Command and Data Handling) system to reproduce the failure here on the ground. I’ll update you on this when we know more. As we continue out toward the Kuiper Belt, our flight plan for August is pretty boring, since we plan to hibernate throughout the month. 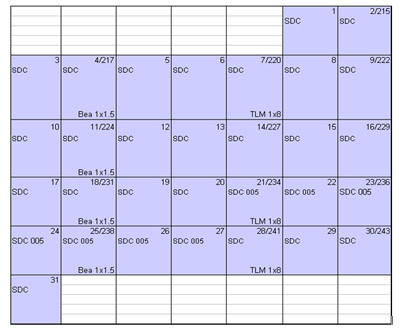 The figure below summarizes that plan; in it you can see the Monday beacon passes (“Bea”) using one DSN station each for 1.5 hours, and the bi-weekly Thursday telemetry contacts that use a DSN antenna for eight hours. You can also see that the Venetia Burney Student Dust Counter (SDC) instrument will be taking data all month, as is normal during hibernation. Those with a sharp eye will notice an extra Thursday telemetry pass at the end of August; this is because we want to gather extra engineering data just before emerging from hibernation on Sept. 2. Some of you may also notice the code “SDC 005” on a few days near the end of August; this indicates a special internal calibration of the SDC we’ll perform when hibernation ends, to help with data analysis from the instrument. 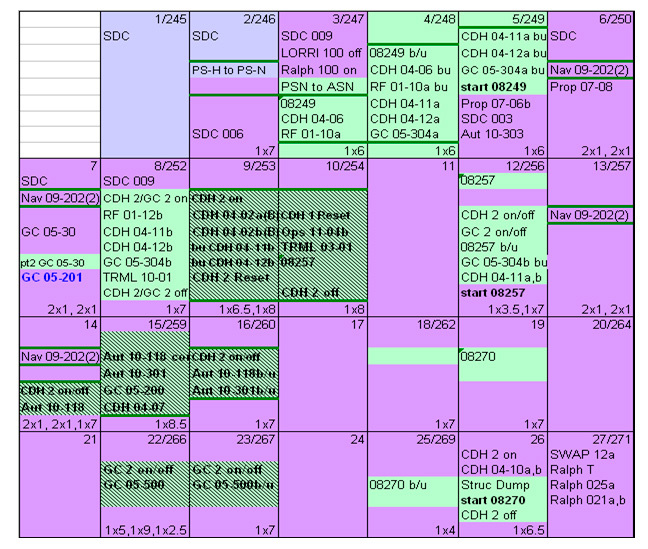 The August flight plan calendar for New Horizons as it continues in hibernation. Like a kid returning to school in the fall, New Horizons gets busier after August. The plan for September-October-November involves a zoo of checkout activities, spacecraft tests, software updates, and instrument calibrations and tests that comprise our second ACO (“Annual Checkout”). ACO-1 was conducted last fall; we didn’t conduct one in 2006 because we were still commissioning the spacecraft and instrument payload in preparation for our early-2007 Jupiter flyby. I’ll write more about ACO-2 in my next two updates, but just to give you a feel for how much more active the spacecraft will be, compare the September schedule (below) to the August schedule, and think about this: October will be busier still! As our spacecraft hibernates in August, our mission operations and science operations teams are planning and testing the detailed command sequences for ACO-2, which is, without doubt, an intensive, full-time job. 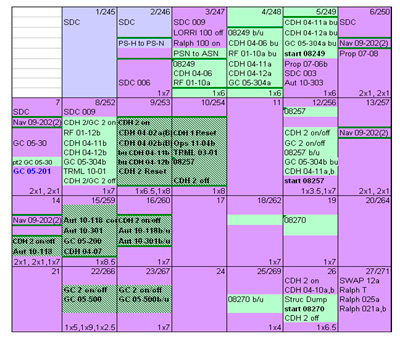 The September flight plan calendar for New Horizons as it begins Annual Checkout 2 (ACO-2). 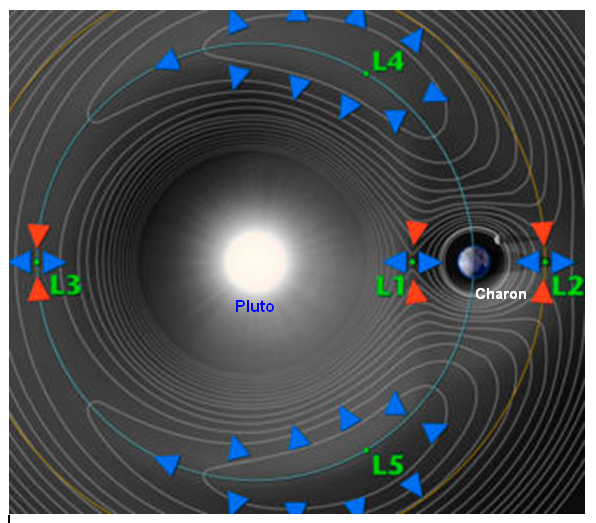 Before I close, I want to tell you about two recent science results that relate to our main flyby target – the Pluto system – and give you a heads up on a cool new way to follow the progress of New Horizons. The first of the two science results appears in the August Astronomical Journal, in a paper by Bradley Shaffer of Louisiana State University and a host of co-workers from various institutions. Brad and company accurately reanalyzed and recalibrated photographs of Pluto taken from the 1930s through the early 1950s. The really neat thing they found is that Pluto’s surface appearance changed a good amount during that time, indicating that frost deposits are migrating around the surface on a global scale due to seasonal and/or orbital distance changes. This has long been suspected, but Brad and his team could conclusively prove it because the parts of Pluto we could see in the early 1930s and early 1950s were identical – something that hasn’t occurred since. Their analysis of the old data using modern techniques made it possible to detect what astronomers of the mid-20th century had missed, and therefore allowed Shaffer’s team to rule out the competing theory – that Pluto’s changing photometric properties were just due to our seeing Pluto from differing angles over the decades. This result also confirms the prediction that global atmospheric change is important on Pluto. Indeed, this may even portend other kinds of changes (like day-to-day or day/night frost migration) will be discovered when New Horizons makes detailed surface maps as it approaches Pluto in 2015. The other scientific result is about the planet’s largest moon, Charon. Submitted for publication by New Horizons co-investigator Mike Summers of George Mason University and three co-workers (myself included), the result is based on new computer models, rather than new data. These models show that some of Pluto’s escaping atmosphere is captured by Charon’s gravity, creating a tenuous atmosphere around Charon which – if confirmed by New Horizons – can be used to help diagnose the escape rate from Pluto. As I close, I want to tell you that the New Horizons project is “Twittering.” If you don’t know about Twitter, go to www.Twitter.com or look up Twitter on Wikipedia; it’s a micro-blogging service. Most weeks we will post a one-sentence update on what New Horizons is doing or where it is, or write something else interesting about the project. To get these updates, check out www.twitter.com/NewHorizons2015 from time to time, or create your own Twitter account and check the box to follow “NewHorizons2015” so you get updates whenever we post them. Pretty sweet –especially if my posts and the other occasional news items on the New Horizons Web page aren’t enough for you! Well, that catches you up with where New Horizons is and what the spacecraft and project team have been doing. I’ll be back with more news in September. In the meantime, keep on exploring, just like we do.